The plan was to meet at fountain hotel at 6am, but everyone turned up by 6:30. 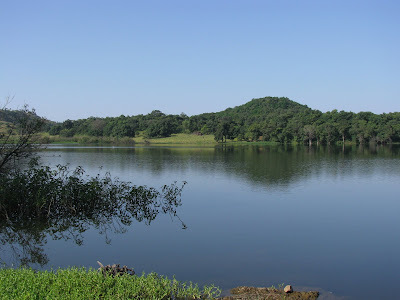 We started the trip with the cool morning air making it a pleasant ride, rode 50 km’s up to manor before taking the first halt at hotel kamat for breakfast. We spent a lot of time there stuffing ourselves with medu wada, idli sambar, dosa and chai while waiting for om but there was no sign of him. A little later we got a message from him saying his chain broke near vasai and he was getting it fixed. We waited there till 9 but his chain was still not fixed so he asked us to move ahead and said that he would catch up with us later. It was already 9 and we had hardly covered any distance so we decided to rip it till navsari since NH8 was a 4 lane highway. Nitin who couldn’t leave at 6, left a little later and caught up with us at dahanu. He complained that his bike electricals suddenly stopped working so we tried fixing it. The culprit was the fuse, we changed it with a spare fuse and set off again. 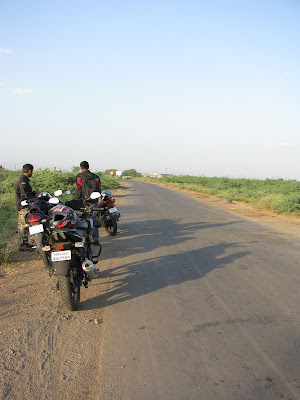 We were riding at 100+ most of the time and covered the 200km’s to navsari in just 2 1/2 hours. Somewhere before navsari his fuse blew off again and the bike kept stalling because of that, so we were forced to take another break to get it fixed. Samir disconnected his horn and the autocop system and changed the fuse again, this time the fuse held through out the rest of the trip. A few km’s later, my bikes gear lever got jammed and it wouldn’t move. So there we were, forced to take another break to check my bike. The problem was a loose bolt that had come off which got in the way of the gear lever. We checked our tool kits but couldn’t find the right spanner to fix it, so we tightened it by hand and rode to find a mechanic with a proper tool kit. We reached navsari at 12:30 and started asking for directions towards NH6 but none of the people knew the way. We were forced to rely on the google maps application on our cellphones to find the way. There was a short 20km road that connects NH8 to NH6, somewhere on this road we found a mechanic and we stopped to get that problem bolt tightened. After this it was another ripping session on NH6. Somewhere along this route we stopped at a small stall selling some Gujrati dish. I am not sure what its called, but we ordered 8 of them and were shocked when we got a bill of just 24rs. 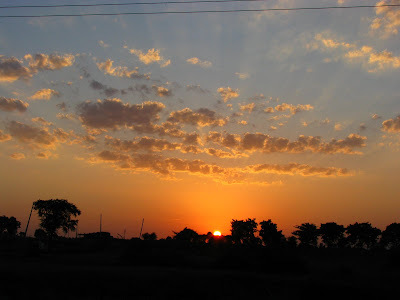 After stuffing ourselves once again, we continued on the left turn towards Navapur. We reached Navapur at 2:30 and stopped at a dhaba for lunch. We sat there for an hour, ordered some channa masala, roti and lots of coldrinks to cool off while the bikes were cooling off as well. A quick glance at google maps showed that we still had a long distance to cover so we didn’t waste any more time and continued on our way. We had reached the junction where we had to get off the national highway and cover the final 130km’s of state highway. We were riding in formation, one behind the other at 100-110 kmph getting stares from all the villagers that we overtook. We took another halt for water after covering 100 km’s. After asking around for directions, we reached a point that was just 50km’s from toranmal. It was only 5pm so someone suggested “why not stop for tea?”. We had tea and left for toranmal at 5:30 thinking we would reach there pretty fast. These last 50 km’s consisted of mainly narrow village roads, with bullock carts blocking the entire width forcing us to go offroad at some patches. It was 6 by now and day light was fading away. 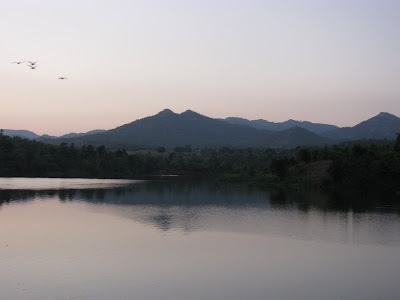 We took one last halt to click the sunset and a nearby lake and then continued on the last 30 km’s to toranmal. These last 30 km’s was where the real fun began. 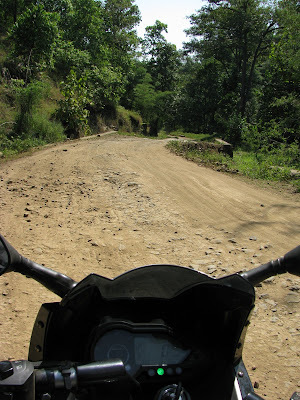 It was a narrow road through the forest, wide enough for 2 bikes to ride side by side, there was gravel and loose stones all over the road, and did i forget to mention that this was a ghat section with steep climbs, steep drops and countless hair pin curves?. It was dark by now and we had to rely on our headlights to make our way through this seemingly never ending ghat. Gaurav and nitin were ahead and samir sagar and me were behind riding together. It took almost an hour to climb the ghat and we finally reached our destination for the day, 1400 meters above sea level, the hill station of Toranmal. The next item on the agenda was to find a place to stay. Most of the places that we inquired about were already full, lucky we were able to find this one bungalow with a kitchen, terrace, balcony and a parking area. All this for just 600. We dumped all the bags in the lodge and were about to leave for dinner when we spotted that familiar white karizma. Om had left vasai at 11am and reached there a little after us, riding non stop. 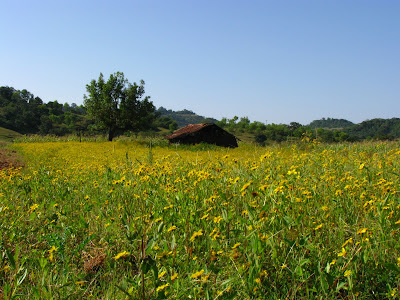 Toranmal is the first place that i have visited which does not have any landline phones nor a cellphone network, its totally disconnected from the rest of the world. Without delaying further we left for the MTDC resort for dinner. They made us wait for almost 2 hours since they were short of seating capacity, but the wait was worth it. The food was delicious. The rest of the night was spent chatting on the terrace and then we called it a night. Everyone woke up by 7 and we were ready by 8. Once again we were in a situation where everyone carried their toothbrush but no one brought the toothpaste. Om and i went out in the market to buy some toothpaste meanwhile everyone was ready. 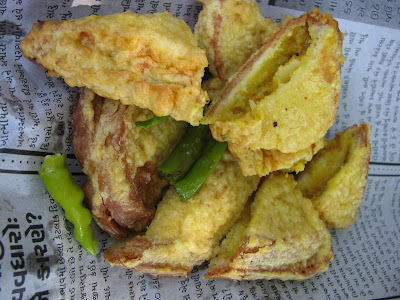 Later on ee stopped at a tea stall for a breakfast which consisted of glucose biscuits. 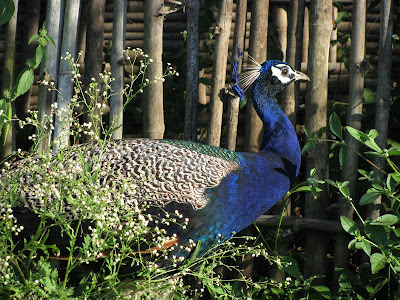 We spotted this peacock along the way and stopped to click a few pics. After breakfast we went for a short walk to yashwant lake and then returned back to the room. There was a vast farm behind our room, and it was calling us. We spent the next 30 minutes wandering around the farm. Once we were done exploring the area near our lodge, we grabbed our stuff and checked out. The next places to visit were the 2 view points nearby. Just like any other view point, they offered a panoramic view of the valley below. A few pics of these view points and we started the return trip. Just when we were all set to start the return journey, we spotted a small sign board pointing towards some cave. Being the inquisitive bunch we decided to try that trail too. What followed was the most fun part of the trip. It was a complete offroad trail with stones, rocks and a small stream. A few km’s into the trail and you find yourself riding along the edge of the cliff with nothing to save you if you slip. This was where the trail ends and you have to take a few stairs to reach the cave. After checking out the cave, we finally started the descend back to sea level and the return trip home. 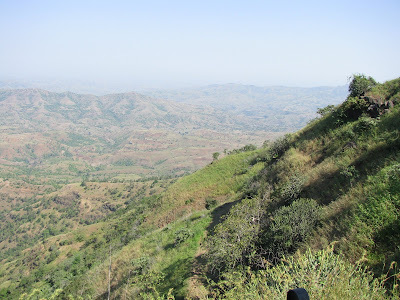 It was almost 12 when we started descending, we finally got a chance to see the ghat that we rode up in the dark. Here’s a pic of one of it’s bad patches. We reached the bottom of the ghat at 12:30 and started riding back. We rode for 100km’s and stopped for lunch at navapur at the same dhaba that we had lunch the previous day, again at 2:30. 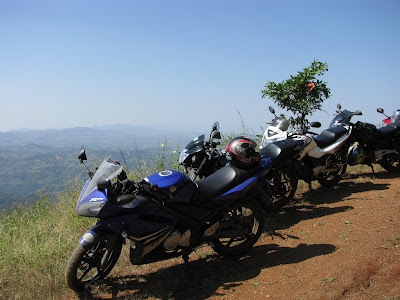 After lunch it was another ripping session on NH6 all the way to the start of NH8. we reached NH8 at 5:30 and took a short break there for tea and to refuel the bikes. 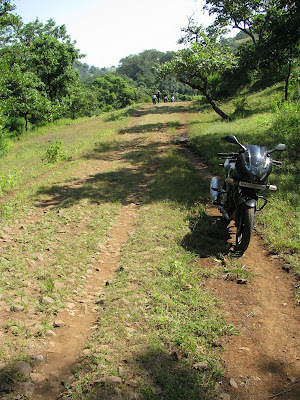 From here onwards the speedometer rarely went below 110 and we ripped all the way up to charoti. We reached charoti at 7:30 and stopped for dinner at another dhaba. Once we were done with dinner we started the final home run and we reached home by 9pm.